Apple Maps recently inked a deal with Ito World, which adds bike-sharing data to Apple Maps in more than 175 cities across 36 countries, reports TechCrunch. 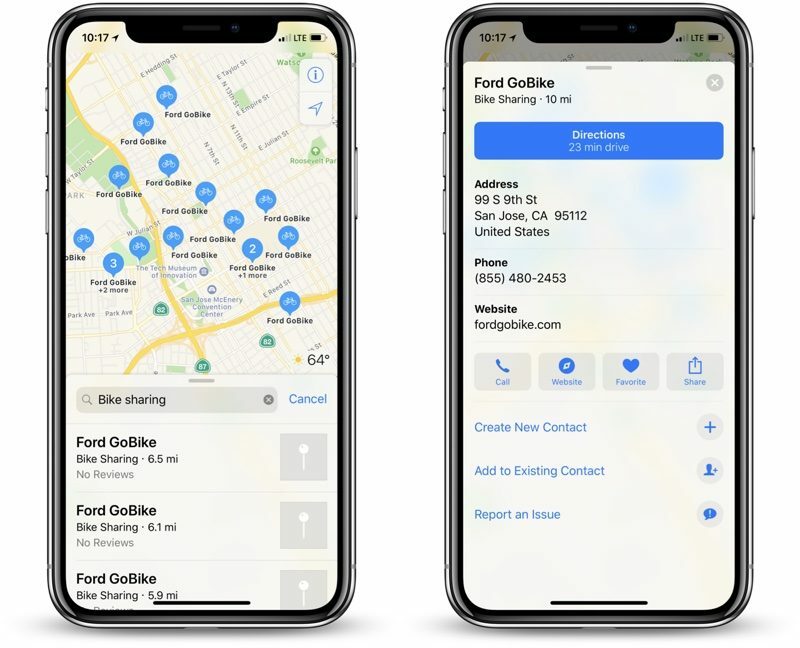 The feature went live this morning, and Apple Maps users can now type "bike sharing" or a specific service name like GoBike into the search bar to get results for nearby bike sharing options. Apple previously had some available bike-sharing data in a few cities in Apple Maps, but with the Ito World partnership, it's more widely available. Ito World has signed deals with dozens of companies to license bike sharing data. Bike sharing information is somewhat limited at the current time, as all Apple Maps lists is the location of the bike sharing stop rather than information on available bikes or empty docks for dropping off a bike. According to TechCrunch, Apple Maps supports a wide range of services like Citi Bike in New York City, Ford GoBike in San Francisco, Biketown in Portland, Santander Cycles in London, Bicing in Barcelona, BIXI in Montreal, and more. Great! If Apple could add bike lanes and cycling directions, that would be a welcomed addition. EDIT: This feature shouldn't be so hard to get to. It should be included as a GUI button. Wow! It's available in Poland, neat. Kind of pointless. Apple Maps doesn't have cycling directions where I am. Nice. These bike sharing systems all have their own apps, of course, which have more features. But this is great for discovering if bike sharing is available near you in an unfamiliar city. Now we just need car charging points with live status/availability! Aaaaand Google Maps also has this. More of a pride project than anything at this point. Google Maps can't seem to separate between bike sharing stations and bike shops in my area. I personally like having a map that's 1) deeply integrated into iOS and 2) isn't selling my movements to Google.